Verywestham: Pig Farmer Delivers the Bacon! Apologies, the title was simply too compelling to pass on. 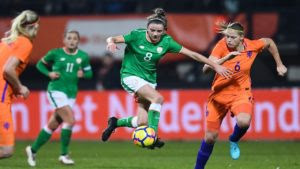 However, the facts of the matter are that unlike a lot of high profile signings, West Ham Ladies' Leanne Kiernan has hit the ground running with a scoring debut against the London Bees at The Hive. The game finished 1-1 with Kiernan a stand out performer. A native of Bailieboro in Co. Cavan, 19 year old Kiernan enjoyed a prolific career with Shelbourne in the League of Ireland befote recently making the move to West Ham. She will be spearheading their attack after their recent promotion to the women's superleague. The 11-team league includes teams from Arsenal, Chelsea, Liverpool, Man City, Yeovil, Everton, Brighton, Bristol City, Brighton and Birmingham City. The team plays at Rush Green - surely worth a visit to watch our team in theur efforts.